At SBEnrc we seek to maintain a constant sense of renewal and relevance. We have again undertaken our process of travelling around Australia to talk to our industry partners, prospective partners and industry associations to drive forward our agenda for collaborative research. 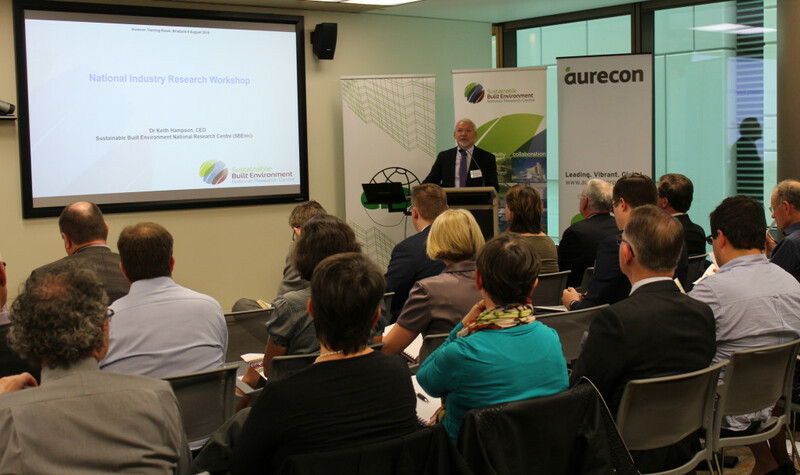 At each workshop, industry attendees were asked to speak – to provide a summary of their industry challenges and prioritised research ideas, and the pathway for research outcomes to impact their business practices. The process was strongly weighted in favour of researchers listening – being able to benefit from hearing the business perspectives. Each will be underpinned by a discrete skills and training development component to be integrated into every project. Our challenge now is to work with core and prospective new partners to develop projects in these five themes, so we can deliver maximum impact for the Australian infrastructure and building industry. We particularly value the input from the many industry associations that participated, including Master Builders Australia, NATSPEC Construction Information, Infrastructure Sustainability Council of Australia, ARRB Group, ConstructionQ, Royal Automobile Club of Western Australia, Built Environment Design Professions, Property Council of Australia, Engineers Australia and the Australian Institute of Architects. We are now forming project development teams to work on specific projects in these themes through September and October. I welcome genuine expressions of interest from individuals representing prospective partners to contact me. On an international level I’m delighted to accept the role of Vice President of the CIB, effective 1 June 2016. I can now also confirm that the SBEnrc and Curtin University will host the November 2017 CIB Global Board Meeting in Perth. To coincide, we will also host an international conference to profile research across the SBEnrc research network on 15 November 2017 in Perth. We look forward to providing further details as this is developed. Please save the date for this important research dissemination initiative in Perth. 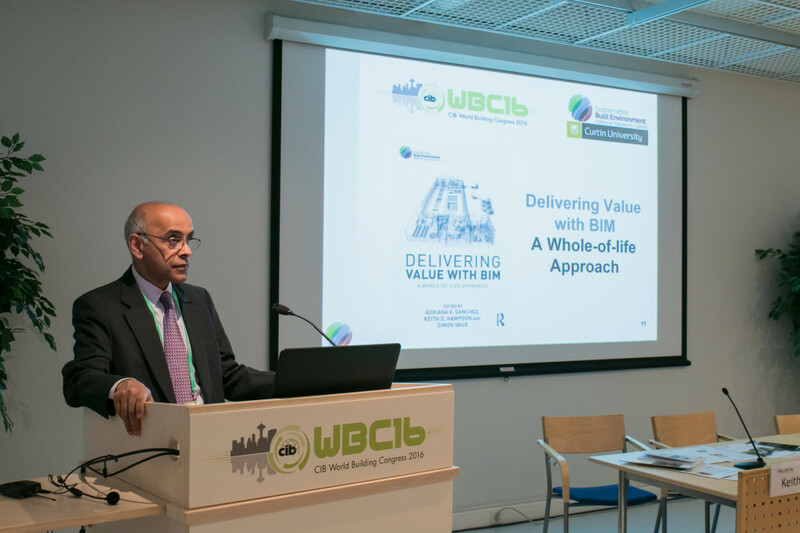 I’m proud to announce that our latest book, Delivering Value with BIM, edited by Adriana Sanchez, Keith Hampson and Simon Vaux, was launched and endorsed by Dr Shyam Sunder, Senior Advisor to the Deputy Secretary, US Department of Commerce, at the CIB World Building Congress in Finland on 1 June 2016. Our Governing Board Chair John V. McCarthy AO was recognised for his international achievement at the recent CIB World Building Congress. The CIB Board acknowledged the outstanding contribution made by John for his extraordinary and long lasting support to the CIB mission to promote worldwide information exchange and cooperation in research and innovation for building and construction. I was also delighted to be presented with the Best Coordinator Award for the 2013-16 triennium, during which the CIB acknowledged my contribution in having provided innovative and inspiring scientific leadership in support to the CIB mission. The SBEnrc was recently awarded the Curtin University Research Impact and Engagement Award in recognition of the fantastic effort from our whole team in striving for excellence and impact in our industry-focused research. Infrastructure Sustainability Council of Australia Conference, 25 October 2016, Sydney. Key issues, trends and opportunities for sustainability including reducing social licence risk, investment trends and the opportunity for infrastructure to contribute to emissions reduction targets. The 2016 conference theme ‘What IS next?’ 2016 Infrastructure Sustainability Conference, 9am–5pm. 2016 Sustainability in Infrastructure Awards, 25 October 2016, 7pm–11pm. The 2016 Conference on Innovative Production and Construction (IPC) September 29 -30 by the Australasian Joint Research Centre for Building Information Modelling, Curtin University, Perth. Contemporary challenges faced by natural resources and built environment industries are discussed by experienced researchers and industry leaders. 2016 prefabAUS Annual Conference ‘Delivering Next Generation Buildings’– Sydney 10-12 October 2016. Features some of the industry’s most highly regarded thought leaders, showcase ground breaking projects, explore innovative technology, and host tours to some of Sydney’s most exciting locations for offsite construction industry. The Warren Centre’s 2016 Innovation Lecture with Marita Cheng, Westin Sydney, Wednesday 14 September. AAPA Sydney Gala Dinner and National Industry Awards, Sept 2016. ITS World Congress, Melbourne, 10-14 October 2016. 27th ARRB Conference, Melbourne, 16-18 November 2016. Engineers Australia Australian Engineering Conference 2016, Brisbane 23-25 November 2016.